The inventor of the world wide web, Tim Berners-Lee, has been awarded a knighthood for his pioneering work. Dubbed the "Father of the Web", he came up with a system over 10 years ago to organise, link and browse net pages. The famously modest man said he was "quite an ordinary person", and although it felt strange, he was "honoured". Sir Tim was recently reunited with the machine he used to invent the web when he e-mailed 80 schools from the UN's summit on the information society. The British scientist, who lives in the US, was told he was getting the unexpected Knight Commander of the Order of the British Empire in the New Year honours list a few days ago - by telephone, not by e-mail. He said he never expected his invention would lead to such an accolade. The physicist created his hypertext program, which was to revolutionise the net, while he was at the particle physics institute, Cern, in Geneva. The computer code he came up with let scientists easily share research findings across a computer network. 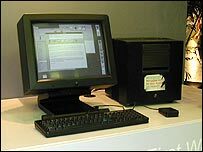 In the early 1990s, it was dubbed the "world wide web", and is still the basis of the net as we know it. He recently told the BBC World Service's Go Digital programme his invention was "just another program", and that he originally wanted it to help achieve understanding. "The original idea of the web was that it should be a collaborative space where you can communicate through sharing information. "The idea was that by writing something together, and as people worked on it, they could iron out misunderstanding." Sir Tim said the honour was an acknowledgement that the net was becoming globally powerful, and not just a "passing trend". "There was a time when people felt the internet was another world, but now people realise it's a tool that we use in this world." He added that his knighthood proves what can happen to "ordinary people" who work on things that "happen to work out", like the web. 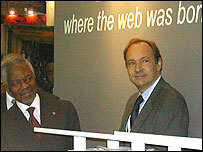 Sir Tim currently heads up the World Wide Web Consortium (W3C) at the Massachusetts Institute of Technology in Boston, where he is now based as an academic.